← A good energy usage report! Strawberry season is officially over, but the blueberries and raspberries are going strong. In fact, the raspberries are fantastic this year. We have a few different varieties of raspberries planted (I’ve lost track of exactly what we have though) and one of the varieties is absolutely huge and very tasty this year. 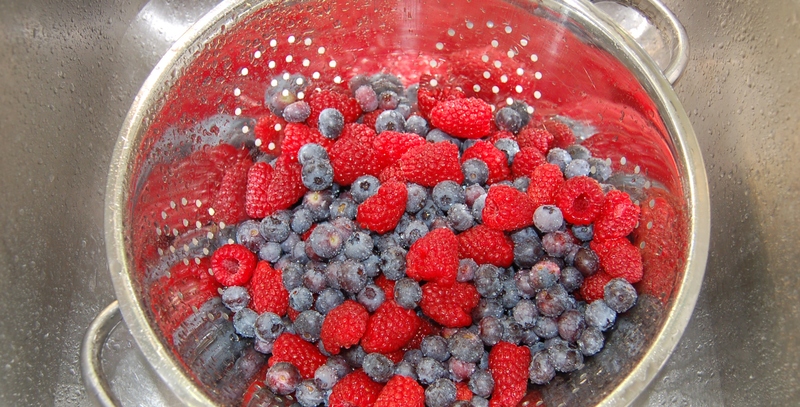 These berries will become mixed berry jam, Lily’s favorite. For the first time, I’ve successfully grown artichokes! I’ve tried a couple of times before but didn’t site them well. These are planted where we used to have our big leaf maple tree. Removing that tree has made the whole front of our yard so much more useful. I’m not entirely sure when to harvest the artichokes, though, so please do share tips if you have any. This entry was posted in Gardening and tagged artichoke, blueberry, raspberry. Bookmark the permalink. Strawberries are not *exactly* over. We’re still getting tons of native (Cascade) strawberries, but they’re somewhat of a PITA to harvest.